It was a pretty good Sunday for Spanish golfers. In Madrid Jon Rahm sent the home crowd into raptures by winning their Open. Somewhere in England, Pep Guardiola enjoyed a round with his son, unaware that West Bromwich Albion had decided to present him with a Premier League title. Guardiola's decision to forego the pleasures of Sky Sports for those of the great outdoors seemed a wise one. Why waste a good day watching the box on the off-chance the bottom club would win at Old Trafford? So Guardiola went golfing and during or after his round won his seventh title in nine seasons as a manager. His latest triumph came just a few days after claims that defeats by Manchester United and Liverpool indicated that City were not quite the genuine article. On Saturday they provided a salutary corrective to these dubious assertions, their 3-1 win over Spurs at Wembley illustrating the extent of their superiority over the rest of the Premier League. City's assignment seemed a difficult one. They were away from home against one of their closest rivals after a week which had included a gruelling European tie and a couple of potentially morale-sapping defeats. Yet they were irresistible against Spurs and could have scored half-a-dozen goals but for slipshod finishing. Spurs were on a 14-match unbeaten league run and had not lost a league game by more than one goal since August 2014, but they were utterly outclassed. City have turned everyone else into also-rans this season. With five games still left to play they are only two points behind the record set by Chelsea in 2009/2010. Three more wins will see them surpass the record the Blues set last season. Eleven more goals would break Chelsea's record from 2009/10. Chelsea also set the goal difference record that term with plus-71, City are plus-68. Guardiola's team now lead the league by 16 points, two shy of Manchester United's record, which has stood since 1999/2000. City have enjoyed one of the great Premier League seasons. It may actually, taking everything together, be the greatest one of all. So it seems utterly wacko that this time last week excitable pundits claimed the shine had been knocked off the team's triumph by their derby defeat against United. Short-term thinking may be the curse of the modern age, but this was taking it to extremes. In reality the derby was merely a Premier League equivalent of those Munster football finals won by Cork against Kerry teams who a couple of months later lifted the Sam Maguire. It wasn't a turning point or a line in the sand. It didn't amount to a hill of beans. We're always advised to remember that the league is a sprint rather than a marathon. Yet last week it was treated like one of those truncated indoor dashes where everyone thumps into the track wall at the end. The truth is that City have been as dominant in the Premier League as Paris Saint-Germain and Bayern Munich have been in theirs. Local Bragging Rights didn't seem to be much consolation to United fans watching yesterday's debacle. Not for the first time in recent seasons a fug of stolid gloom settled over Old Trafford long before the final whistle. 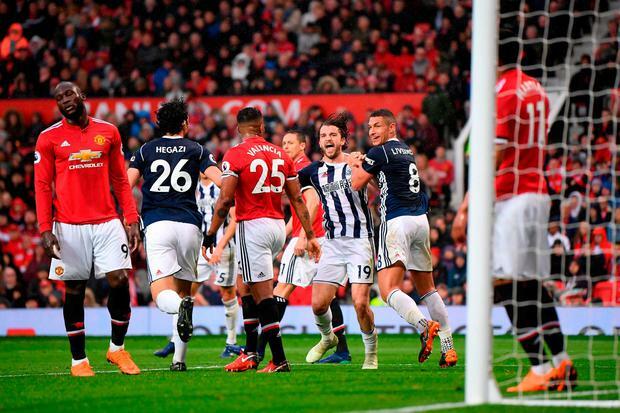 When Guardiola was informed of the United result he might well have imagined some gallant last-ditch effort by the visitors, balls being kicked off the line, bodies packed into the box, Albion getting the rub of the green, but it wasn't like that. Both sides had the same number of shots on target. There seemed little difference between the team lying second in the table and the team propping it up. If Saturday illustrated how good City can be, yesterday showed how low United can go. Of the top four clubs it's likely their supporters have enjoyed the season least. City have won the title, Liverpool enjoyed a great European campaign and wonderful entertainment, Spurs have exceeded expectations for a third season on the trot. But while United may finish runners-up, it's hard to charge those who booed the team off yesterday with ingratitude. Even at their best Mourinho's side don't offer much more than a pragmatic extraction of the necessary result. The phrase 'a job well done', with all its prosaic implications, seems the perpetual accompaniment to their victories. When United don't get a result, there is little for supporters to enjoy. The close-season talk will mainly be of money. The manager will insist that enormous spending is the only way to challenge City. Those convinced a War Chest solves all should note that Anthony Martial and Mo Salah cost the same. Meanwhile the fans will be urged to feel pride when some financial yardstick indicates that United remain The Biggest Club In The World. There is an appropriately corporate air to United's football these days. It possesses all the imagination, excitement and joie de vivre you'd expect from a large multinational with one eye eternally on the balance sheet. How strange to witness this at a club which once embodied sporting romance. Whereas City resemble Sixties United, the new Red Devils play like Seventies Arsenal. Early Seventies Arsenal. Fair play to West Brom for summoning up a last hurrah, but word is they're preparing for life in The Championship. As United sent in the barrage of long balls and hopeful crosses, the Baggies must have felt they were already there. Guardiola presumably enjoyed his game of golf. But I bet he wasn't as much below par as United were yesterday.